1. Korban Minchah, Judeo-Arabic. By Rabbi Baruch Asbagh. Razon printing, Casablanca 1939. 2. Slichot, some in Judeo-Arabic, with Hatarat Nedarim. Book Trading of Yosef Lugassi, Casablanca. 3. Pesach Haggadah, with translation into Judeo-Arabic. Book Trading of Yosef Lugassi, Casablanca 4. Misgav Le’atot—prayers. By Rabbi David Asbagh. Amar printing, Casablanca 1948. 5. Five Books of Torah with Haftarot. Library of Avraham A. Hadida, Casablanca. 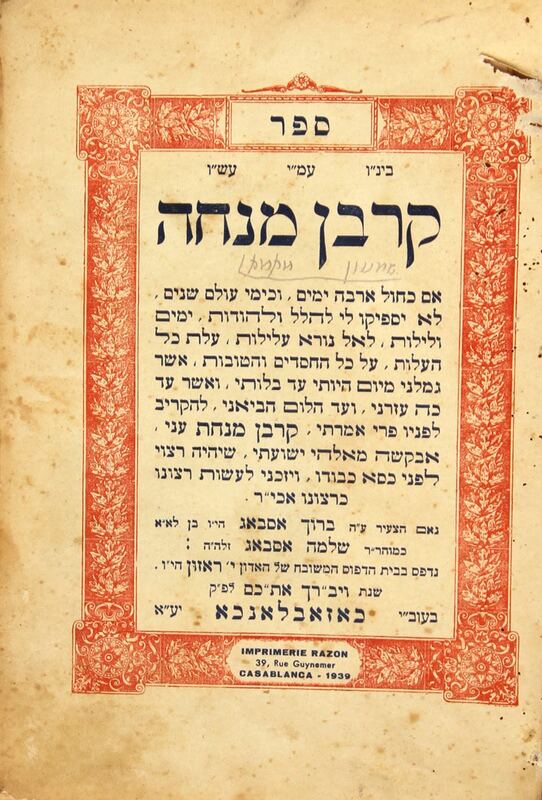 6.  copies: Keren LeDavid—chiddushim by Rabbi David HaKohen. Printed by the Atzayag brothers, Mekhnes. 7. Pesach Haggadah, with translation into Judeo-Arabic. Partially missing. 8. Pesach Haggadah, with translation into French. Partially missing 9. Minchah BeLula, Judeo Arabic. By Rabbi Baruch Asbagh. Book Trading of Yosef Lugassi, Casablanca Different sizes and conditions, generally ok.